Shouldn't every kid get the same quality health care? Kids of color are more likely to be uninsured than white kids, and research on the general population shows that people of color get lower quality of care than white people--even when they are insured and have similar incomes. 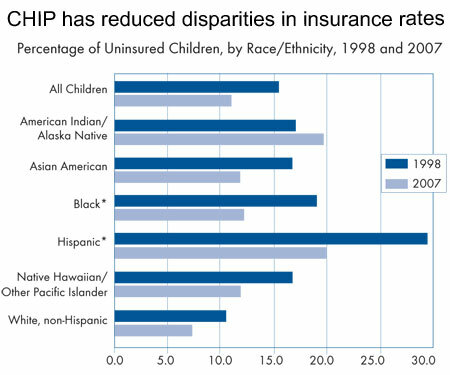 The federal Children's Health Insurance Program has done a lot to whittle away at the disparities between the uninsurance rates of white children and those of Hispanic, black, Native Hawaiian and other Pacific Islander children (the uninsurance rates for American Indian and Native American kids went up). But we have a ways to go if we want to make sure every child gets high quality health care. Data for Washington state paint a similar picture, with 34 percent of American Indian children and 15 percent of black children going uninsured, compared with 11 percent of white children. The Children's Health Insurance Program Reauthorization Act, signed by President Obama in February, includes a number of provisions targeted at getting children of color insured. They include: providing grants to reach out and enroll uninsured children, removing the five-year waiting period for legal immigrant children and pregnant women, and upping the rate the federal government pays for interpretation and translation services. Beyond simply providing insurance, the feds are developing a system of measures--designed specifically for kids and their health issues--to gauge whether some children are getting poorer care than others. A new policy brief from Families USA goes into all the details.